Mr. Rhee at a workout in 2002. His regimen included 10 sets of 100 push-ups each day. WASHINGTON — Grandmaster Jhoon Rhee, a Korean-born martial artist who settled in Washington, D.C., and helped popularize tae kwon do in the United States, preaching a philosophy of ‘‘truth, beauty, and love’’ while teaching members of Congress how to kick and punch, died April 30 at an assisted-living community in Arlington, Va. He was 86. The cause was complications of shingles, said his son Chun Rhee. When Mr. Rhee was diagnosed with the disease, about six years ago, it brought an abrupt end to a training regimen that included 10 sets of 100 push-ups each day. At 60, he had performed one of those sets in less than a minute during a House committee hearing on aging. For his 80th birthday, he performed a set in 50 seconds before a crowd of onlookers in the Cannon House Office Building. Few martial artists were as accomplished as Mr. Rhee, a onetime aircraft mechanic in the South Korean military who exchanged fighting tips with fellow martial artist Bruce Lee and boxer Muhammad Ali, and taught tae kwon do to columnist Jack Anderson, actor Chuck Norris, and Washington Redskins coach George Allen. Mr. Rhee was not the first person to establish a professional tae kwon do studio in the United States, but he was the first to offer instruction, Yates said. 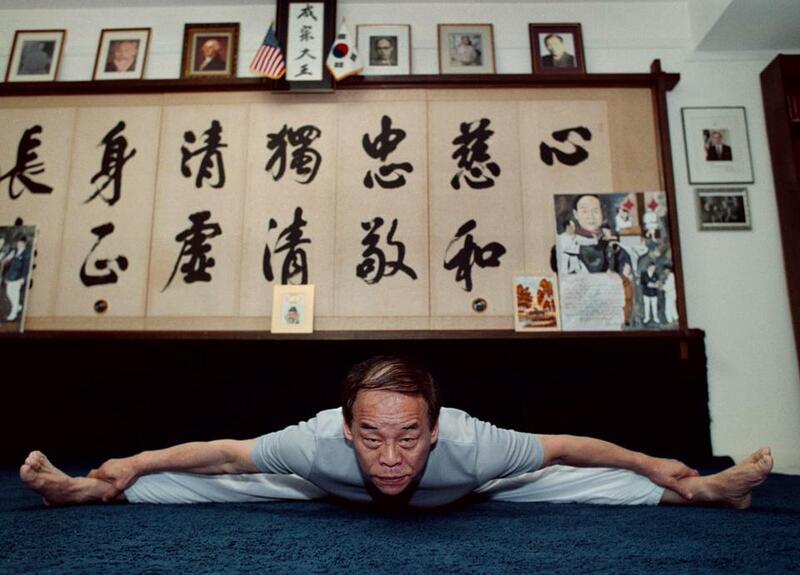 He began teaching classes in 1956, when he arrived in Texas as part of a military training program, and in 1962 established a gym in downtown Washington, D.C.
At his professional peak, in the mid-1980s, Mr. Rhee operated a network of 11 martial arts studios across the Washington region, catering to more than 10,000 children and adults. He initially advertised his classes by writing letters to foreign ambassadors in the city, promising that he could improve their children’s discipline through the study of tae kwon do. By the 1970s, he had begun broadcasting a television commercial that made him a household name locally. Mr. Rhee gained additional exposure through the Congressional Taekwondo Club, which he organized in 1965 after reading a Washington Post report that Representative James Cleveland, a New Hampshire Republican, had been mugged. Mr. Rhee offered the congressman free tae kwon do lessons in self-defense and went on to hold open sessions in a Capitol basement two or three times each week. By his count, he trained more than 250 lawmakers, including Speaker of the House Newt Gingrich, Senator and future Vice President Joe Biden, and Representative James Jeffords. Mr. Rhee was attending high school in Seoul when he began learning the new technique, and at first kept the lessons secret from his father, a clerk who believed martial arts was little different from street fighting. He worked as an interpreter for the US Air Force after the Korean War broke out in 1950 and was eventually drafted into the South Korean army. Six years later, he traveled to San Marcos, Texas, for a training program at Gary Air Force Base (later known as Camp Gary). Mr. Rhee began teaching informal tae kwon do classes and was studying engineering at the University of Texas when he dropped out in 1962 to move to Washington. He had been offered a teaching position at a karate school, at a time when few American martial arts academies distinguished between Japanese karate and Korean tae kwon do. The position was a bust. The school had six students and could not afford to pay Mr. Rhee, who left to start his own tae kwon do academy. Mr. Rhee wrote several books, led seminars and starred in one martial arts film — ‘‘When Taekwondo Strikes,’’ also known as ‘‘The Sting of the Dragon Masters’’ (1973) — at the suggestion of Lee, whom he met a decade earlier at a competition in California. ‘‘Bruce Lee helped me with my punch, and I helped him with his kick,’’ Mr. Rhee said. In the mid-1970s, he became a trainer to Ali, teaching him a right-handed move he dubbed the ‘‘Accu-punch’’ — a move that occurs so fast, Ali said, ‘‘you won’t hardly see it.’’ The punch helped Ali knock out British fighter Richard Dunn in 1976. Mr. Rhee retired from teaching in 1980 and sold his company several years later, his son said. He soon focused on introducing tae kwon do to the former Soviet Union, where Jhoon Rhee-affiliated schools now exist in Ukraine, Russia, Uzbekistan, and Kazakhstan. One of the last remaining Jhoon Rhee schools in the United States, located in Falls Church, Va., is run by his son Chun Rhee. His first wife, the former Han Soon Hahm, died in 1996. He leaves his wife of 20 years, the former Theresa Chun of McLean, Va.; four children, Chun Rhee of Falls Church, Va., James Rhee of Clarksville, Md., Joanne Rhee of Seattle, and Meme Rhee of Santa Monica, Calif.; one brother; two sisters; and four grandchildren. Mr. Rhee said he began practicing tae kwon do partly as a way to fend off school bullies, and he sometimes recounted a moment in high school when he revealed his abilities by punching a bully in the eye and kicking him in the throat. But he insisted that the martial art was less a manner of fighting than a way of life, an endeavor that forces its participants to unite their minds and bodies in a singular act of discipline.